Papua New Guinea football seems to have unstoppable momentum at the moment, with the senior national team leading the charge. 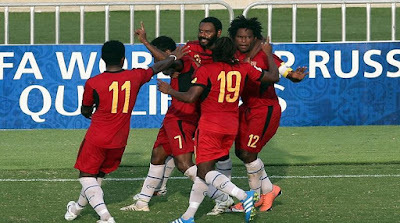 A late developer even by Oceania standards, the nation first came to the attention of many in 2010 as Port Moresby side Hekari United broke New Zealand’s dominance in the OFC Champions League, reaching the 2010 FIFA Club World Cup in the process. Five years later came a medal at the Pacific Games – a feat achieved by the nation’s U-23 side. But in the last 12 months, the list of milestone achievements has grown exponentially. Last year Papua New Guinea’s senior side – the Kapuls as they are affectionately known – won through to their maiden OFC Nations Cup final, only narrowly missing an unlikely ticket to the FIFA Confederations Cup. PNG even hosted their maiden FIFA tournament in the form of the FIFA U-20 Women’s World Cup. Now PNG are within touching distance of another first – a spot in the Oceania play-off for the 2018 FIFA World Cup Russia™. Their reward for all their recent success has been a new high on the FIFA/Coca-Coca World Ranking, with PNG now sitting at 156 following a rise of 14 spots. Papua New Guinea’s football story began in earnest only in the 1990s. Remarkably, despite being the largest current OFC member by population, PNG’s World Cup odyssey commenced during qualifiers for the 1998 World Cup – long after several of their rivals in the Melanesian region. PNG’s potential was obvious from the outset. The Kapuls’ France 98 campaign began with a remarkable first-up win over New Zealand. But PNG is one of most ruralised nations on earth, and that presents challenges still being felt today. Every trip between major cities involves a costly flight. “There is a lot of talent in this country, but the problem is to identify them because of the country’s geography,” PNG’s Danish coach Flemming Serritslev said. However, it is clearly a hurdle Serritslev – a sprightly septuagenarian – and his PNG side are overcoming. PNG tackle Solomon Islands home and away in June, where four points against their Melanesian rivals will guarantee passage to the OFC play-off against New Zealand. The winner of that match will face the fifth-placed South American nation for a spot at Russia 2018. Success, they say, begets success. That has certainly been true for PNG. As a result of last year’s high-profile achievements at the Nations Cup, numerous national team players – more than any OFC island nation – are now plying their trade overseas. “After the Nations Cup there was a lot of focus on our players, and that has been good for the individual players,” Serritslev said. The next challenge, regardless of World Cup results later this year, will be to continue the upward trajectory. “I hope we can continue to develop the team by playing matches in international windows,” Serritslev said.